During the summer of 1967, race riots swept across U.S. cities. Detroit was the scene of one of the worst of these. The State of Black Michigan is a landmark volume that investigates how, since 1967, Michigan's black population has changed, how its interactions with the white community have altered, and, most important, how policymakers can act to further narrow the "equality gap" that continues to persist. In the wake of the 1967 Detroit riots, in which 43 people were killed, President Lyndon Johnson established the National Advisory Commission on Civil Disorders and posed these questions: What happened? Why did it happen? What can be done to prevent it from happening again? The commission concluded that white racism spurred the violence and that "our society is moving toward two societies, one black, and one white—separate and unequal." The State of Black Michigan takes Johnson's questions further and applies them to Michigan's black citizens today: Are the ingredients of the explosive mixture that erupted in 1967 still present? What differences are there forty years later? Is Michigan in fact a state with two separate and unequal societies? The twenty essays in this volume pursue the answers to these questions by studying a broad range of topics, including socioeconomic inequality, black self-help, black business development, residential segregation, crime, health, and political representation. The essays report and reflect on the racial disparities that still remain. 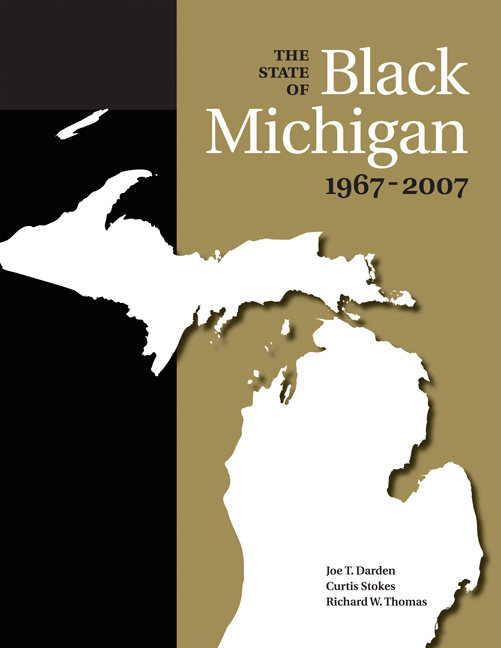 The State of Black Michigan, 1967–2007 uses the most recent data available and expands on reports the editors published annually between 1984 and 1993 with the Urban Affairs Programs at Michigan State University and the Michigan Council of Urban League Executives. With the goal of racial equality still frustratingly elusive, and with reliable data often difficult to obtain, it is hoped that The State of Black Michigan will serve as a magnet for conversation and debate about race, inequality, and the need for action. Curtis Stokes is Professor in James Madison College and Director of African American and African Studies at Michigan State University. He also serves as series editor of the Black American and Diaspora Studies book series for Michigan State University Press. Stokes has been the recipient of many awards, including an MSU All-University Excellence in Diversity Award (2001), Co-Director of a Ford Foundation Grant (2000-01), and a State of Michigan Teaching Excellence Award (1991).